“We were treating a patient today and talking about pain. 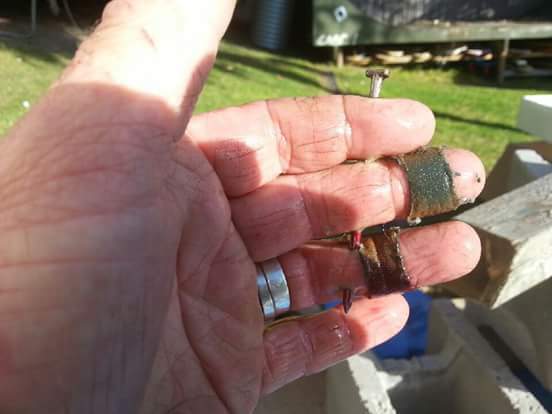 She told us she was recently sent a photo of her brother’s hand after a “small accident” with a nail gun and noticed that her pain was much better after seeing it! Of course we asked our reader if he could check whether it might be ok for us to share the story – and everyone involved was eager and happy for us to do so – we even got a few more details. The patient’s brother wasn’t even aware that he had done it until he went looking for the nail. He thinks it was about 3 ½ seconds before he was even aware that he had shot himself through the hand. He said even then it didn’t really hurt until he went to hospital and they started poking around trying to work out what they were going to do. Does anyone want to contest that physical and emotional pain are very close if not the same!!! !